The Christian Institute reports that the 400th anniversary of the King James Version of the Bible will be marked with a series of special stamps in 2011. "A spokesman for the Royal Mail confirmed the decision, saying: “Royal Mail can confirm that the 400th anniversary of the publication of the Authorised King James Version of the Bible will be marked on a special stamp set to be issued during 2011.”"
As this isn't listed in the preliminary programme we can assume it will either by an expensive Commemorative Sheet or the Christmas issue. According to Linn's Stamp News (US), Kathryn Hollingsworth of Royal Mail press agency Aawaz Communications confirmed that the King James Version will be used for the Christmas issue - "specifically nativity scenes inspired by verses from it". Update: Faststamps take flight at Stampex, in September! Six is an odd number considering the labels are dispensed in strips of 5. It would be better, surely, to leave the robin to be included in a Christmas-themed set? Although all shown as 1st class 100gr, the Faststamps will, of course, be available with any of the 5 service indicators. 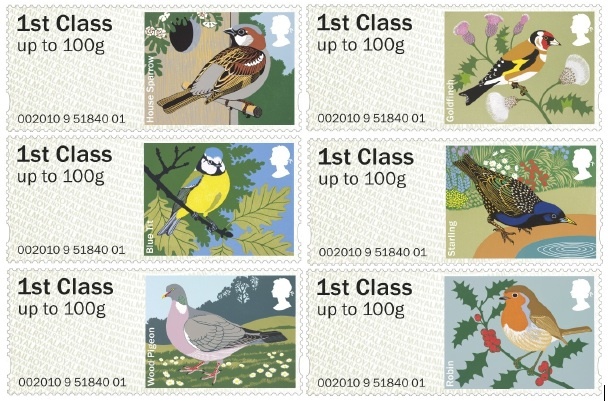 There will also be a pack from Royal Mail containing all 6 designs, and a generic Post & Go FDC, with three official first day of issue handstamps. These can be seen on our website here, together with any other special handstamps. I wonder where the yellow went - Wales 1st class oddity. Why are cylinder numbers and plate numbers printed on sheets of stamps? Partly it's to record which plates have been used, and partly to show which colours have been used. Although there are other methods - like colour dots/traffic lights - the cylinder number also shows that the colours are all present and properly aligned. So here's a little mystery which goes back to 2006. On the left, the original version with colours as listed in the catalogue: blue-green, greenish-yellow, silver & black. 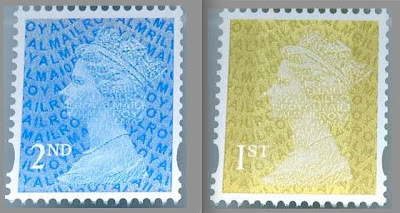 On the right, the 2006 version with the yellow replaced by black - but the stamp looks the same. 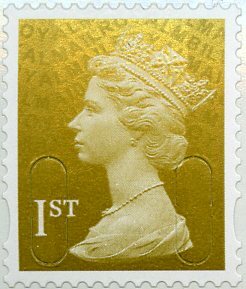 Indeed, the stamp IS the same, I'm sure yellow is still present (* no it isn't!). Below, the date and colour-check marks in the right margin, also with the yellow replaced by black. So what's the point? If the yellow wasn't clear enough to see when the sheets were checked, how does replacing the yellow cylinder number with a black one - which must have been printed with the black cylinder - help anyone?? * Official response here. Security Machins with MA10 code - update. Printing dates reported as 02/03/10 and 03/03/10 - thanks Richard for dates and photo! Fine used Gold Horizon label with no service indicator. It seems to me that there are at least two reasons why this would have happened. 2. 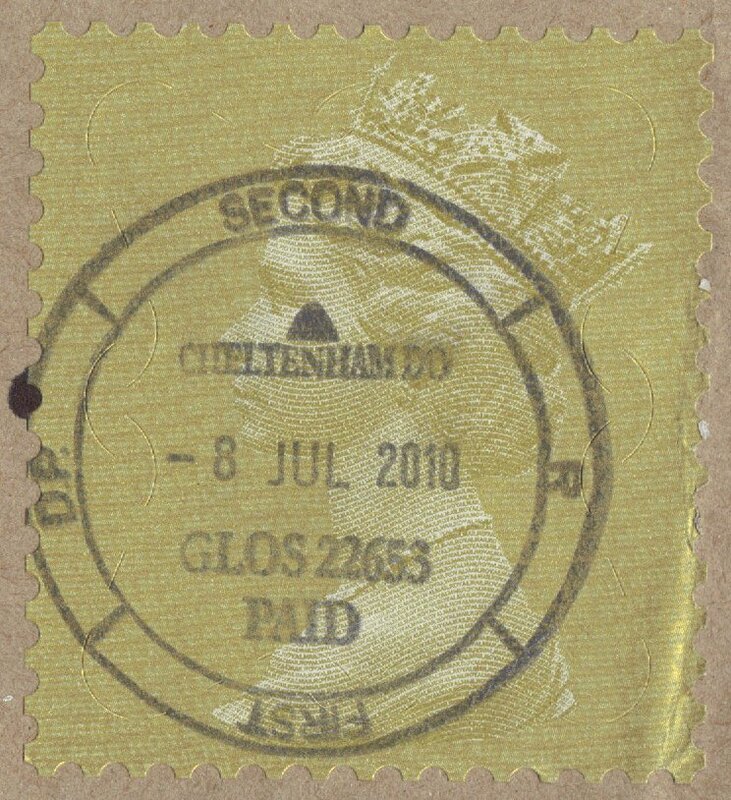 There was a fault with the Horizon printers at the counter and Cheltenham deliberately used this handstamp on them. That doesn't make much sense as if they couldn't print on the labels they should have used stamps! Cheltenham Delivery Office is in Swindon Road; the main counter office is now located in WHSmith in the High Street. Is this associated with new staff, when the PO is relocated in the high street, rather than long-service Post Office employees? It's surprising how long some things exist before they are discovered - or before their existence is revealed by the people who discover them. When the Country definitives were reprinted with white borders in October 2003 there were some major changes from the previous 'all-over' designs. 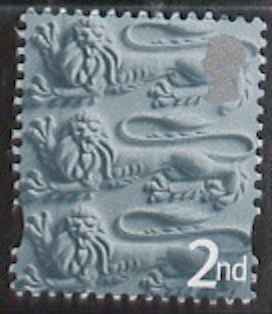 Originally the Northern Ireland stamps had the face value and Queen's head in white (that is, they were 'reversed-out' of the colours - unprinted space) whilst all the others were silver. 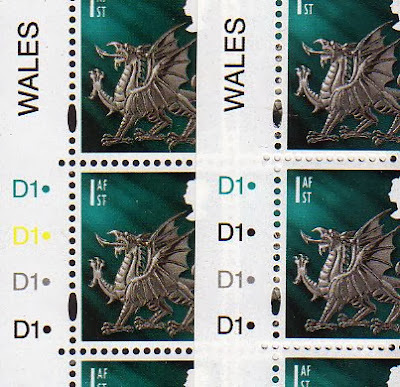 For the version with white borders the Wales stamps changed from silver to white/reversed-out. 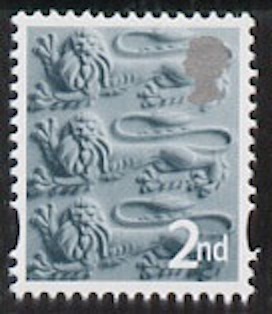 In the case of the England stamps only the format of the Queen's head also changed, and this is known as a Type 2 head, the previous one being Type 1. I can think of no real reason why the England stamps should change while the Scotland silver heads stayed the same when they are printed by the same printer. When postage rates increased in 2005 there was doubt that De La Rue would be able to print the 42p country stamps to the required deadline, and the job was given to Walsall Security Print. Their stamps were released on 5 April. 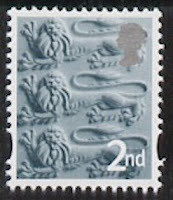 The De La Rue versions of the same stamps were issued on 10 May and 26 July (Northern Ireland). As soon as they were received dealers and collectors made efforts to identify differences and they were immediately obvious on all four values. but the head looked different as well. In fact, with silver printing on top of the oak leaves, consistency would always be a problem as the silver did not need to be precisely in any particular position - a small variation would be acceptable. At the time I wrote: The shape of the back of the hair, particularly below the ribbon is markedly different but this may be to do with the properties of the metallic ink. This image has been digitally brightened. When the 44p and 72p values were issued in March 2006 they followed the same pattern. England stamps had type 2 heads and the others had type 1. And there the story ought to have ended. Except that all the England values have also been found with Type 1 head. Some sources say that these arise from late 2005 to mid 2006 reprints but a print date of 10/7/07 is stated to exist for the 72p. Why this should be so is hard to understand, as the 78p value was issued in March 2007! I suspect this is actually 10/7/06. The ribbon is the most obvious feature. 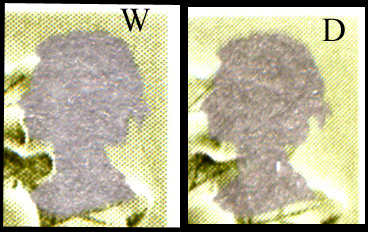 The top of the head in the top picture has an extra wave in the hair, and there is less detail between the nose and the chin. And the two types exist on all four values - 2nd class, 1st class, 44p, 72p. Subsequent rate increases produced the 48, 50p, 56p, 60p, 78p, 81p, 90p & 97p all with Type 1 heads. The 2nd class and 1st class are, of course, available at normal prices as the reprints continued to have Type 1. The 44p and 72p Type 1 are very scarce. Those distributed by Royal Mail on standing order will be Type 2. It isn't even clear whether the Bureau had the type 1 printing of these values or if they were distributed only to Post Offices. In any case, it is well worth looking at used copies - these differences ought to warrant full listing in Stanley Gibbons GB Concise catalogue in the same way that the Type 2 regional definitives of 1986/87 do. The Northern Ireland 17p and the Scotland 31p Type II are both catalogued at over £100 used! The moral of the story is that it may well be worth looking closely when you get any new versions of stamps that have been reprinted many times. Time to dig out the 30x magnifier or get the scanner working. We looked closely at the 42p, but few people would have looked carefully at later issues. And when it comes to country stamps, it's always worth buying some at post offices as well as from the Bureau. If they are the same, you can always use them for postage! Two more retail booklets are being issued without the printer's name. 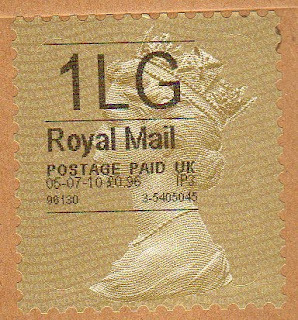 Royal Mail's Philatelic Bureau counts this as a 'visible change' (to the booklet) even though they take no notice of the visible change to stamps with MA10 codes, so these will be distributed on standing order. The booklets are printed by Walsall, and the stamps have the normal year and source codes with no other differences as far as I can see. That means both are MA10, with MSIL on the 1st and MTIL on the 2nd class. And all booklets, cylinder and non-cylinder, have 7.5mm edge strips - this may be the standard in future as the wide strip is already standard on Christmas booklets. Faststamps get the bird - at Stampex, in September! Whilst the introduction of the Machin head was welcome, I have been advocating for some time the use of pictorial Faststamps as used in other countries. Spain, for example, has used machine-vended variable value labels in similar designs to adhesive stamps, which seems a good idea if you have enough machines to make the print run worthwhile. Imagine, 10 different cats & dogs for Battersea were issued as 1st class stamps and those attractive designs could easily have been adapted for Faststamps. Although nothing was done for the London 2010 Festival of Stamps - they only just managed to get the Post & Go machine installed - these machines must be essential for the 2012 Olympic Post Office, not just in the public areas but in the (closed) Olympic Village as well. I can't believe Post Office Ltd and Royal Mail will pass up an opportunity to provide a service which will reduce the number of counter clerks required. We have news today of the first steps along this avenue, as Faststamps take flight at Autumn Stampex, on Friday 17 September. We don't have details yet, but have been sent images of six new labels with garden birds, as shown below. Six is an odd number considering the labels are dispensed in strips of 5. It would be better, surely, to leave the robin to be included in a Christmas-themed set? Although all shown as 1st class 100gr the Faststamps will, of course, be available with any of the 5 service indicators. 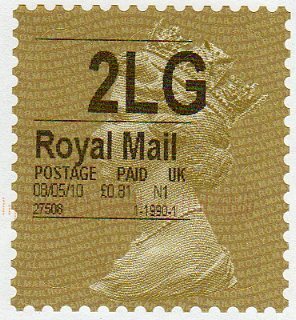 - whether a special FDC will be produced by Royal Mail - remember, Post & Go is a Post Office Ltd product and the labels are not a product of the Royal Mail Stamps & Collectibles programme. With these being launched on the Friday we will have three new issue days at Stampex. The regular stamp issue on day 2 is the Medical Breakthroughs set, whilst on the first day of the show the 70th Anniversary of the Battle of Britain is marked with a retail booklet and generic Smilers sheet. I've never really understood the terminology attached to the new Post Office Counters computer system. The old system, in use for about 8 years nationwide, is called 'Horizon' - hence Horizon Labels. The new system is called 'Horizon Online' - but given that the old system enabled realtime financial transactions, cash withdrawals etc, that must have been online in a sense. I'll await clarification! What I do know is that the system menus are different, and notices appeared in our crown office asking for patience while they acquainted themselves with the new system. A by-product is a further change in the type face used on Horizon labels. The most recent version is shown below left, and the new version alongside. Unchangeable software affected the old style, meaning that the Service Indicator text started in the centre of the printed area, rather than being centered, and often extended beyond the ruled lines. This has been rectified in the new version, although the Royal Mail text is still left-justified. The postcode and session numbers appear now to be right-justified giving the printing an overall neater look. Offices which are not yet using gold Machin labels but which have the new software will produce the new type on white labels. I would be interested in images - or even examples - of any of these, especially Welsh. I'd also like to show Welsh gold 'online' labels. Although you can see all blogposts about these by clicking on the MA10 keyword at the foot of some posts or in the word-bubble on the right of the page, I thought we had reached the stage where a summary might be useful. 24 February - retail books 12 x 2nd, 12 x 1st. MTIL (discovered April). Both were sold by Royal Mail at Stampex but not noticed at that time. The 1st class has no printer's name and was scheduled for issue on 15 December 2009 although we believe that the first Bureau distribution was actually in January. One printing of these stamps does not have the MA10 code, and these are still being issued by Royal Mail's Tallents House Bureau against stock code UB309. As Royal Mail have not separately listed the booklets or stamps with MA10 security code, the old stock for this code will probably be replaced by MA10 coded stock with no prior announcement. 25 February - Olympic/Paralympic mixed retail book 6 x 1st - MCIL (discovered April). 30 March - retail book of 6 x 1st with London 2010 advertisement MSIL (discovered April) - this was the first booklet in which the new code was noticed, which prompted dealers and collectors to look back at the year's earlier booklets. 8 May - at the London 2010 Festival of Stamps: retail books of 4 x 1st Large and 4 x 2nd Large, code MFIL. Previous versions had the source code in the word FOYAL. 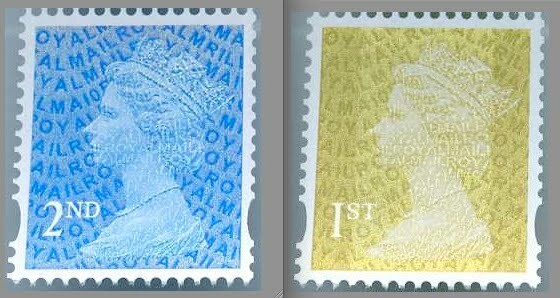 8 May - in the King George V prestige stamp booklet 2nd class, 1st class & 50p coded MPIL. This was the first 50p stamp issued other than in counter sheets. What sets these three apart is the existence of two different types of security slits (paperclip) and differences in the interrupted perforations. 13 May - 2nd & 1st class coils of 500 and 1000 coded MRIL. The first security stamps on ordinary gummed paper and therefore without security slits. 30 June - 2nd class counter sheets - code MAIL. Printing date 10/03/10 as 1st class. 30 June - 1st class Business Sheet This remains unconfirmed. I've now received a copy on a letter from Birmingham dated 20 July 2010 with MBIL source code. Richard reports printing dates are 02/03/10 & 03/03/10 - picture here. 12 August - 2nd class (letter) Business Sheets - printing date of 05/03/10. November - the 1st class Large from counter sheets (code MAIL) - we have limited supplies. Picture now here!